During the second half of the nineteenth century, in an effort to combat diseases such as the plague and cholera that spread with impunity across international borders, Iran was at the center of international politics and cooperation. The studies in this book begin with the role Iran played in the international efforts to mitigate the spread of these diseases at a time when the international medical community differed in their opinions about the contagious nature of these diseases and the need and usefulness of quarantine. The essays continue with discussing malaria and rinderpest, which also caused a great deal of human misery and economic loss. The Iranian government, as well as the Anglo-Iranian Oil Company–a major employer at the time–took steps to suppress and mitigate the effects of these diseases that ravaged the work force. Influenza was a relatively unknown disease for Iran, which in 1918 caused many deaths, like in the rest of the world, and thereafter, became part of its annual disease pattern. Finally, a rather little known medical condition, that of geophagy–the practice of eating earth–is discussed. 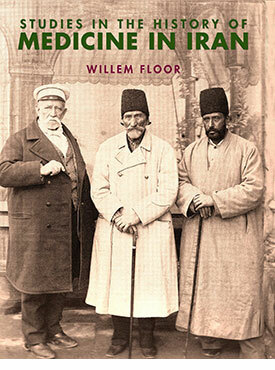 In the 1850s, to develop its own medical infrastructure and improve public health the government of Iran hired foreign physicians such as Joseph-Désiré Tholozan and Johannes Lodewijk Schlimmer to train future Iranian physicians and provide medical advice and technical assistance. The essays about these two doctors contain exciting new research and information. Willem Floor studied development economics and non-western sociology, as well as Persian, Arabic and Islamology from 1963-67 at the University of Utrecht (the Netherlands). He received his doctoral degree from the University of Leiden in 1971. Since 1983, Dr. Floor was employed by the World Bank as an energy specialist, however, after his retirement in 2002, he has dedicated his time to the study of the social and political history of Iran, and has published extensively throughout this time. His books include: Public Health in Qajar Iran, Agriculture in Qajar Iran, and The History of Theater in Iran, as well as, The Persian Gulf: A Political and Economic History of 5 Port Cities, 1500-1730, its second volume, Persian Gulf: The Rise of the Gulf Arabs, 1747-1792, third volume, The Rise and Fall of Bandar-e Lengeh, the fourth volume, Bandar Abbas: The Natural Gateway of Southeast Iran, and the fifth volume, The Persian Gulf: Links with the Hinterland Bushehr, Borazjan, Kazerun, Banu Ka’b, & Bandar Abbas, The Persian Gulf: The Hula Arabs of The Shibkuh Coast of Iran, and The Persian Gulf: Dutch-Omani Relations A Commercial & Political History 1651-1806, and The Persian Gulf: Muscat – City, Society and Trade . He has also published, Travels Through Northern Persia, 1770-1774, Titles and Emoluments in Safavid Iran, and A Social History of Sexual Relations in Iran; Labor and Industry in Iran, 1850-1941; Guilds, Merchants and Ulama in 19th Century Iran; The Rise and Fall of Nader Shah; Games Persians Play, and History of Bread in Iran. His translations include: Samuel Gottlieb Gmelin’s Travels Through Northern Persia 1770–1774 , and with Hasan Javadi, Abbas Qoli Aqa Bakikhanov’s The Heavenly Rose-Garden: A History of Shirvan & Daghestan; Evliya Chelebi’s Travels in Iran and the Caucasus, 1647 and 1654; A Man of Two Worlds: Pedros Bedik in Iran, 1670–1675, Awake: A Moslem Woman’s Rare Memoir of Her Life and Partnership with the Editor of Molla Nasreddin, the Most Influential Satirical Journal of the Caucasus and Iran, 1907–1931, and Engelbert Kaempfer: Exotic Attractions in Persia, 1684–1688: Travels & Observations.